This win of Ginebra against Rain or Shine (ROS) is very important because it will increase their confidence and it will give them momentum coming into the semi-finals of the 2011 PBA Governors' Cup. The Gin Kings were also able to create a three way tie with Alaska and Petron, thus they are just 1 win behind Talk 'n Text and 1 game ahead of B-Meg and ROS because of this 98 to 90 victory over the Elasto Painters. Ginebra now have 5 wins and 3 losses just like Alaska and Petron. The Gin Kings had a hard time in getting the lead against ROS in the first quarter because Arizona Reid was able to outplay Ginebra's import Donald Sloan. Reid led his team, ROS, in getting the lead from Ginebra, 27-26, at the end of the 1st quarter. In the 2nd quarter, Donald Sloan got hot, he led them to a run that gave his team the lead. He was able to make 8 straight quick points to give his team a 34-27 lead. 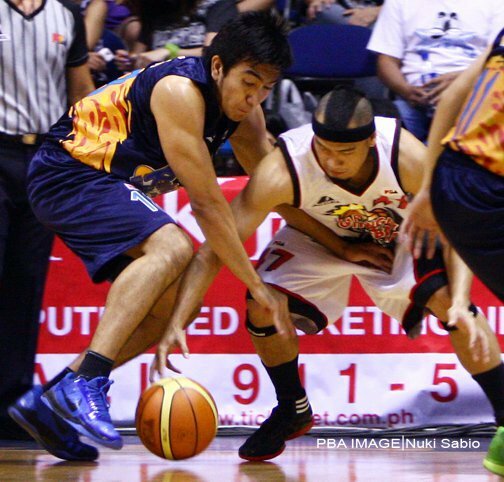 Sloan, who replaced the injured Curtis Stinson, outscored the entire ROS team. All in all he had 12 points in the second quarter while the whole ROS team only produced 14 points. His points came from almost everywhere on the court. He made three-pointers and at the same time he made great lay-ups. Mark Caguioa also had a big night. He also made great shots in the second quarter to give Ginebra a 51-41 lead at the end of the second quarter. They had a comfortable 10 point lead at half time. Since then they never looked back to ROS. Ginebra was able to protect their lead up to the 4th quarter. It's interesting to note that Donald Sloan all in all had 20 points and 4 rebounds by the end of the first half alone. He has just turned on his jets and all I can say is that he's virtually unstoppable. He led his team to a 17-0 run in the second quarter. In the 3rd and 4th quarters of this game, Donald Sloan and Mark Caguioa were still the ones who scored big time for the Gin Kings. When these two guards of Ginebra score a lot for their team, they're unstoppable. Rain or Shine can't stop this new duo of Ginebra. Sloan and Caguioa are just unstoppable. What more if Jay Jay Helterbrand, Ronald Tubid, John Wilson and JC Intal were also hot for Ginebra? That is scary on the part of their opponents. They can definitely outscore any team in the PBA if ever that situation happens. In this game, Sloan scored 32 big points. His output was the largest in this game. Caguioa on the other hand added 13 points. Together, they led Ginebra to this convincing win that might give them the confidence to go all the way for the crown. I consider this win as a convincing one because Ginebra was able to beat a relatively good team who has good quality players and who has a good coach in Yeng Guiao. Here are the scores from PBA.PH. 3, Rodriguez 2 , Tang 1, Arana 0, Ibanes 0.